Cabbage often gets bad press, evoking bad memories of unpleasant school dinners but it doesn’t have to be like that. With a careful hand, cabbage can be transformed from the stuff of nightmares to a versatile and delicious addition to many a meal. Cabbage is part of the brassica family – other notable members include kale, Brussels sprouts and broccoli. Cabbage varieties commonly eaten in the UK include white, green, red, spring greens, pak choi, Chinese leaf (or napa cabbage), hispi and Savoy. Kale and cavolo nero (black cabbage) are becoming increasingly popular too, particularly as the former is considered an anti-oxidant rich super food. There is a cabbage in season virtually every month of the year particularly during the winter. Red cabbage is at its best in the months around November followed by white cabbage in December, Kale in January, Savoy in February and spring greens in March. Hispi cabbage, Chinese leaf and pak choi take over in the spring and summer before the winter cabbage season begins again. Most cabbage varieties only need to be shredded and quickly steamed, blanched or stir-fried, while some can be fermented, pickled or chopped up and used raw in salads. Whatever the variety, cabbage should never be soggy; like pasta it’s best served al dente with a bit of crunch to it. 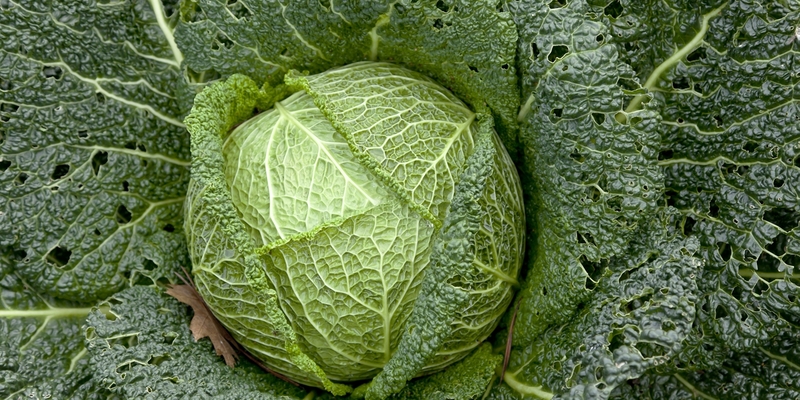 Overcooked cabbage can be smelly as well as lose all its nutrients – white cabbage is especially prone to this. Green and white cabbage varieties usually only require 3–5 minutes cooking, whatever the method, while red cabbage is suited to slower-cooking methods such as braising. If boiling or steaming cabbage, you can add further flavour by transferring it to a frying pan with a little oil or butter and frying it for an extra minute or two. Pak choi,spring greens, Chinese leaf and Savoy cabbage are all great for stir-frying in a very hot wok; just add soy sauce and rice vinegar for flavour and cook until wilted. Alternatively, white, green and red cabbages can be served raw – finely slice and marinate in olive oil and lemon juice as part of a salad, or combine with carrots, onions and chilli for a fresh vibrant coleslaw. Fermented cabbage dishes such as kimchi or sauerkraut are also popular dishes in many countries. Although fermented cabbage may not sound that appealing, these sweet and sour dishes are absolutely delicious. Pickled red cabbage is also popular and ensures you can keep eating this winter vegetable long after the season has ended. The flavour of cabbage can range from sweet and delicate braised red cabbage to deeply earthy cavolo nero which is beautifully matched with gamey pigeon in Theo Randall’s recipe. Cabbage is mostly used as a side dish to compliment a range of main courses. Shaun Hill’s soy coleslaw recipe would be perfect alongside Asian-inspired dishes, while Adam Gray’s simple Hispi cabbage and shallot recipe would be equally at home served with a roast dinner or a quick midweek meal. Graham Campbell uses Savoy cabbage leaves to wrap up his Vegetarian haggis as their crinkly leaves look very pretty and festive. Pak choi, with its light watery stems and deep flavourful leaves, are beautiful in stir-fries or married with delicate, aromatic Asian flavours, as Shaun Rankin does in his Thai-style haddock in a bag. Don’t forget that leftover cabbage can be used up in all manner of ways - Josh Eggleton serves up the classic bubble and squeak with his pork shoulder recipe.